(Photo by Joy Bonala/KACU) Col. David Benson, center, assumes command of the 7th Bomb Wing after Col. Michael Bob Starr, right, relinquished command Thursday, October 29, 2015 at Dyess Air Force Base. 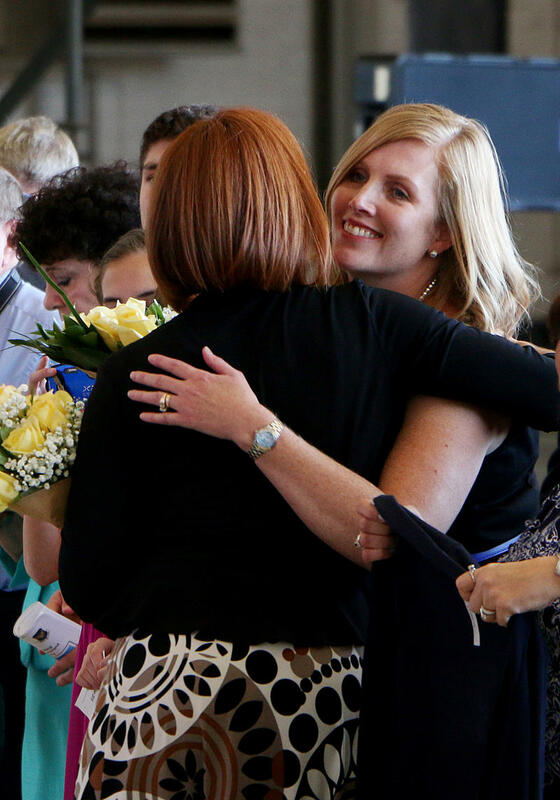 (Photo by Joy Bonala/KACU) Anne Benson, right, and Kim Starr hug after Col. Michael Bob Starr relinquished command of the 7th Bomb Wing to Col. David Benson Thursday, October 29, 2015 at Dyess Air Force Base. 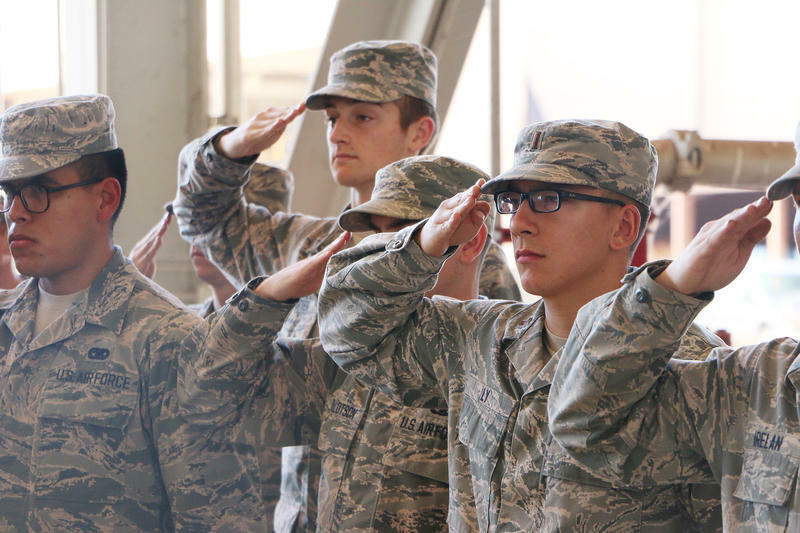 (Photo by Joy Bonala/KACU) Airmen salute during the 7th Bomb Wing change of command change ceremony Thursday, October 29, 2015 at Dyess Air Force Base. 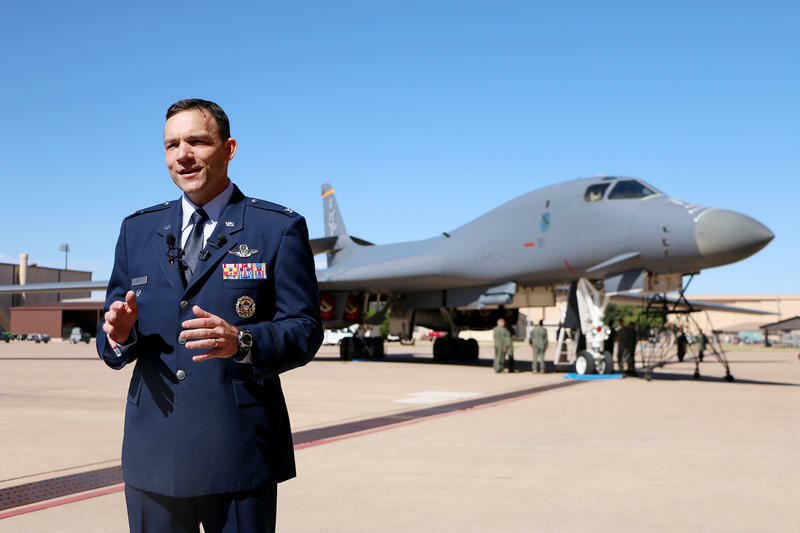 (Photo by Joy Bonala/KACU) Col. David Benson addresses the media before assuming command of the 7th Bomb Wing Thursday, October 29, 2015 at Dyess Air Force Base. (Photo by Joy Bonala/KACU) Col. Michael Bob Starr gives an outgoing remark before relinquishing command of the 7th Bomb Wing Thursday, October 29, 2015 at Dyess Air Force Base. 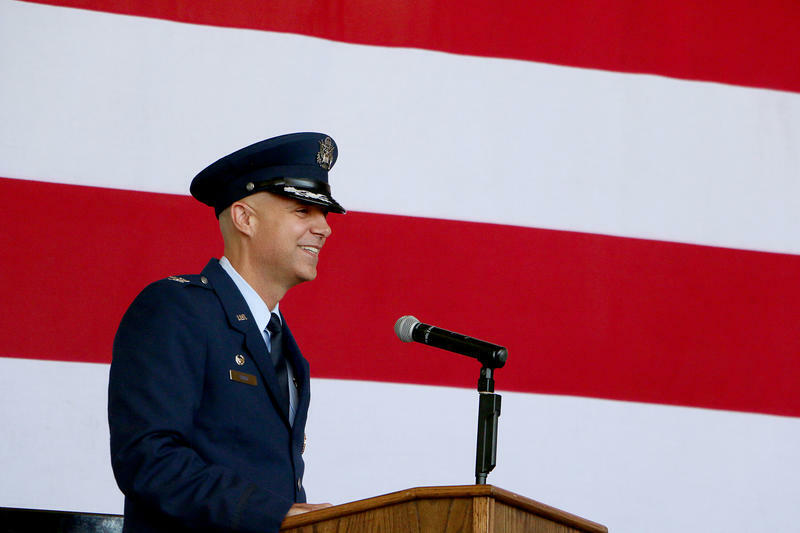 (Photo by Joy Bonala/KACU) Col. David Benson addresses the media before assuming command of the 7th Bomb Wing during the change of command ceremony Thursday, October 29, 2015 at Dyess Air Force Base. 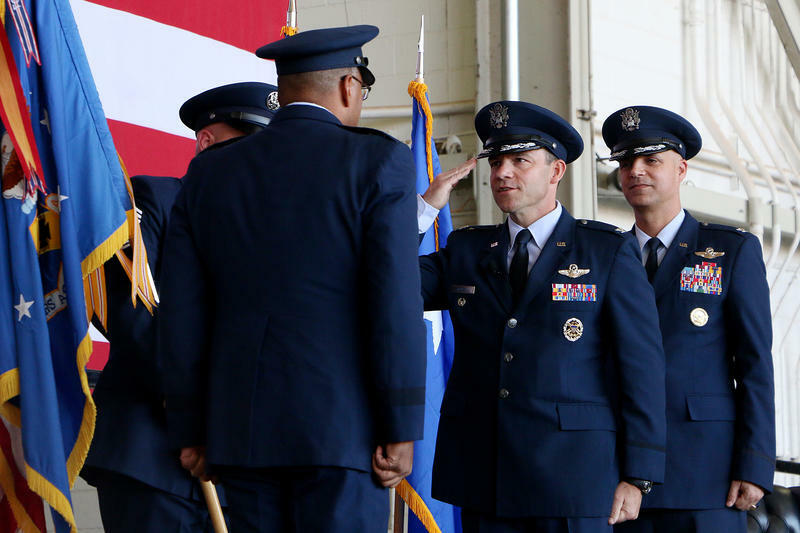 Dyess Air Force Base is under new leadership after a change of command ceremony Thursday. Col. Michael Bob Starr relinquished command of the 7th Bomb Wing to Col. David M. Benson in front of an audience of airmen and their families at Dyess. Col. Starr served as commander since February 2014. Col. Benson says he’s excited to be in Abilene where the good relationship between Dyess and the Big Country is legendary throughout the Air Force. 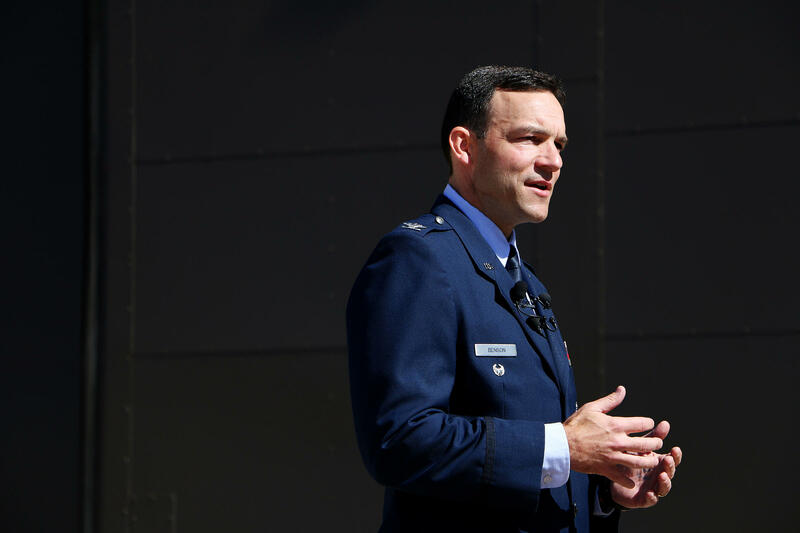 Benson previously worked as a B-2 pilot and says his different perspective will help integrate the B-1 and Air Force Global Strike command to help build a bigger and better bond among the bomber community. Benson also emphasizes the potential of all airmen under his command at Dyess. “Every airman is a leader,” Benson said.